In stock -This product will ship today if ordered within the next 15 hours and 10 minutes. Aged garlic contributes to normal heart, liver and immune function. 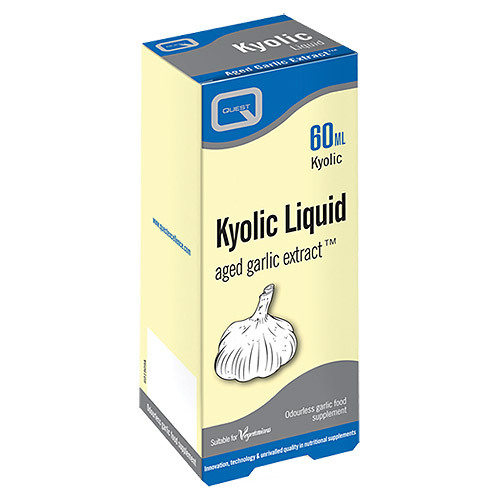 Kyolic garlic is produced from organically grown cloves cold aged for 20 months to produce sulphur containing compounds. Shown to lower total and LDL blood cholesterol, improve blood circulation, support healthy blood pressure levels, reduce platelet aggregation and adhesion to blood vessel walls. Aged garlic also has antioxidant actions to enhance immune function, reducing the risk and duration of infections and protecting cells from oxidative damage by free radicals. It also enhances the activity of liver enzymes to assist detoxification pathways. Why use Quest Kyolic Garlic? As a dietary supplement, take 1/4 to 1/2 teaspoon or 30-60 drops with a meal twice daily. Do not exceed the stated dose unless instructed by a qualified health professional. Keep in a cool, dry place with the cap tight. (Refrigeration recommended after first use). 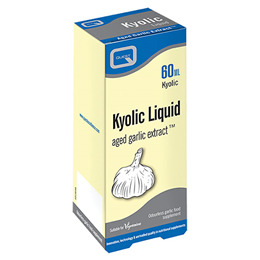 Below are reviews of Quest Kyolic Liquid - Aged Garlic Extract - 60ml by bodykind customers. If you have tried this product we'd love to hear what you think so please leave a review. I have used this for several years and believe that it improves circulation and health in general.